Tira Palmquist’s play Two Degrees is that rare and wonderful thing, a really great new play. 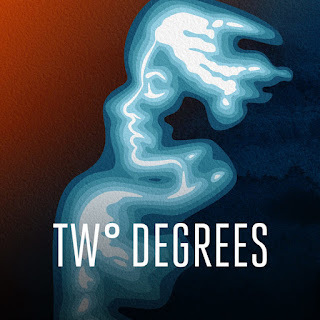 Prime Productions’ presentation of Two Degrees in the Dowling Studio at the Guthrie Theater is a production that lives up to a really great script and makes it even better. Two Degrees pulls off the nifty trick of being about something as big and universal as the fate of the earth, and something as (deceptively) small by comparison as one person’s broken heart. But the shattered pieces of that heart have an enormous ripple effect on everyone around that character. Dr. Emma Phelps (Norah Long) has been summoned to Washington, D.C., by her old friend - now a senator - Louise Allen (Jennifer Whitlock). Emma is to testify before a Senate panel on the effects of climate change, which she has been studying by examination of ice core samples in Greenland. While she was away on one such expedition last summer, Emma’s husband Jeffrey (Joel Liestman) died. Emma’s grief has her seeing Jeffrey’s face on complete strangers, including Louise’s chief of staff, Wilson (also played by Liestman, in a clever bit of double-casting on the part of the author). In her D.C. hotel, Emma hooks up with a stranger named Clay Simpson (Toussaint Morrison). At first it seems like a one-night stand, but circumstances keep bringing them together in ways that end up being quite surprising. The play has a few tricks up its sleeve that I won’t give away. They don’t detract from the seriousness of the subject matter, but they do add a bit of unexpected fun to the proceedings. Everyone in the four person ensemble does great work under the direction of Shelli Place, but the play in large part belongs to Norah Long as Emma. Because of the structure of the play, we see her under increasing pressure in the present, and also through intermittent flashbacks to her life with Jeffrey and her work on the ice in Greenland. If Long didn’t handle these transitions so smoothly, it might be harder for the audience to follow along. Because of the strength of Long’s performance, you never get lost in the timeline of the story. Emma’s grief often makes her a difficult person to deal with, but because the script keeps the audience in the know, even when other characters aren’t, we can understand and forgive her for sometimes being a jerk to other people. In fact, everyone has their moments in Two Degrees where they might be less than likable. But weirdly, it always seems to come from a place of people caring too much, rather than too little. So even though Louise, Wilson and Clay are all, each in their own way, Washington, D.C. players and pragmatists, they are all, also, working toward some greater good, even if their methods are often at odds with each other, and with Emma. There aren’t any villains in Two Degrees, just heroes with flaws and baggage (sometimes a lot of both). Joel Liestman digs in to all three of his roles, as the late lamented Jeffrey, senatorial chief of staff Wilson, and even a bit role as one of Emma’s Greenland co-workers on the ice, Malik. Jeffrey’s face is never far from Emma’s life, past or present. As Emma’s old friend in a new position, Jennifer Whitlock exudes confidence and gravitas as Louise. Senator Allen knows how to get things done, and she’s playing a long game. And if you’re going to rebound after the loss of a great love, you could do a hell of a lot worse than Toussaint Morrison as Clay Simpson. Clay is good-natured and caring right from the play’s opening scene, and his easy-going charm grows on Emma, long after he’s already got the audience in his back pocket. And not to treat the man like a piece of meat or anything - he’s a talented actor, everyone here is - but Clay looks equally sharp in a suit, a T-shirt, or… less, and the play features him in all those states. The guy’s not without his secrets, but he’s still a good guy (and that’s hard to write and even harder sometimes to play on stage, so kudos to writer, director and actor alike on this one). Palmquist’s script also wisely chooses to hold back on any in depth discussion of climate change until late in the story. We get hints, but it’s only after we’re fully invested in all the characters that the real debate about climate change and how to address it begins. Because we care about the characters, we care about the subject, and we listen. The script is a vehicle that makes the stakes of climate change specific and personal. And at that point in the story, we’re willing to listen, because we trust all the messengers, even if they’re arguing for different strategies. Emma’s professional odyssey through D.C. also becomes a personal odyssey which helps start to thaw her out from where her grief and guilt had left her frozen in place. Not all warming is bad. The staging for this story of multiple timelines and even more locations is quite ingenious and economical. The back wall of the set is a towering wall of rippled cloth, often lit in a wash of blue, giving off the look and feel of the face of a glacier. The rest of the stage, and the human activity that passes over it, lives in the shadow of this wall of ice. But it’s also a surface for projections - of locations in Washington, D.C., or the collapse of an actual melting glacier, the change between night and day, past and present, even the image of Jeffrey haunting his wife in the corner of her mind, large as life. But Annie Henly’s set isn’t just a surface for the projection of images conjured by Andrew Saboe (projection content) and Andrew Isaacson (image director). Henly’s design has a platform that serves as many locations both above and below with the simple switch-out of furniture pieces. And the hotel bed (which, fair warning, gets a lot of action, right from the opening minutes - they don’t have an intimacy coach - Annie Enneking - for nothing) appears and disappears underneath that platform in a fun bit of theater magic between scenes. Jeni O’Malley’s costumes, Karin Olson’s lights and Anita Kelling’s sound all help reinforce time and place in evocative ways, and there’s even some plaintive original music courtesy of composer Kevin Farrell.